Strengthening a culture of integrity involves on the one had the enforcement of clear sanctions. Such implementation echoes citizens’ concerns with regard to immunities or opacity that may sometimes result in defiance towards public officials. April was peculiarly marked by a series of judicial decisions across the world against public officials at the highest functions of the State such as in Brazil or in the Republic of Korea for instance. Full enforcement of sanctions in cases of breaches to public integrity remains a guarantee of credibility of implementation of anticorruption and integrity policies. Indeed, news in April highlighted how corruption scandals may result in profound political crises, such as in Slovakia or Brazil, or be key in the framework of electoral campaigns such as in Colombia, Lebanon or Mexico. On the other hand, full implementation is complementary to measures of prevention, awareness-raising and counsel. April demonstrated again that numerous initiatives and standards are being developed in this field, at the local, national and international levels. These different aspects are necessary not only to avoid integrity breaches, but also to raise awareness about such phenomena and foster a better understanding of the tools and instruments at the public officials’ and citizens’ disposal. Such mechanisms also aim at strengthening links between public authorities and civil society, fostering transparency and inclusiveness of citizens in public life. On 3 April, the Group of States against corruption (GRECO) published its compliance report for Montenegro in the framework of the fourth evaluation round on corruption prevention in respect of members of Parliament, judges and prosecutors. The Group welcomed measures adopted in Montenegro in order to establish integrity plans on the one hand, including in the Parliament that now also has an ethics code, and to rationalize the financial disclosure system and increase resources allocated to the anticorruption agency on the other hand. 6 out of the 11 recommendations formulated in the evaluation report have been satisfactorily implemented, 2 partially and 3 not implemented yet. An ad hoc report published on 11 April highlighted the GRECO’s concerns with regard to aspects of the laws recently adopted by Parliament on the status of judges and prosecutors, on the judicial organization and on the Superior Council of Magistracy. The most controversial elements presented during summer 2017 disappeared, but the Group concluded that the impact assessment of such reforms was erroneous and the validity of the legislative procedure that led to the adoption of these reforms was questionable. The GRECO notably asked that the creation of a new special prosecutor’s section for investigation of offences in the judiciary is abandoned. The report also took note of the process to dismiss the Head of the specialized anticorruption prosecutor’s office (DNA) launched in February 2018 and called on the adoption of additional guarantees with regard to nominations and dismissal procedures. On 12 April, the GRECO published its evaluation report for Iceland in the framework of the fifth evaluation round on preventing corruption and promoting integrity in central governments (top executive functions) and law enforcement agencies. After the financial crisis in 2008 revealed shortcomings and several controversies led to the resignation of two governments and senior civil servants, the Group stressed that no global strategy has been implemented to promote integrity in the State institutions. The GRECO thus called on Iceland to adopt stronger and more coherent codes of conduct, notably with regard to gifts and benefits or relations with third parties in order to influence government decision making processes and to revolving doors and secondary activities regulations. On 22 April, Independent Investigation Body on the allegations of corruption within the Parliamentary Assembly of the Council of Europe published its investigation report, one year after being mandated to investigate the so-called “Caviargate”. The report strongly endorsed recommendations drafted by the GRECO in 2017 and concluded that there are strong suspicions that several current and former members of the Parliamentary assembly of the Council of Europe (PACE) were involved in corruption activities to the benefit of Azerbaijan. These representatives from national parliaments are suspected of receiving caviar, carpets, nights in luxurious hotels, etc. from Azerbaijan authorities in exchange of votes, in January 2013, against a report denouncing the situation of political prisoners in the country. On that day, the President of the PACE, Michele Nicoletti, invited involved MPs to suspend their activities in the PACE while their situation is being investigated on a case-by-case basis. On 17 April, the members of the European Parliament adopted two reports in order to strengthen rules notably on the use of the general expenditure allowance. For a monthly amount of 4 000€, MEPs are not required to provide any proof of how the money is spent. The “MEPs Project”, an investigative journalists’ consortium, had shed light on widespread abuses in its use in 2017. According to observers, the changes added will not make the MEPs more accountable of such expenses. The dispositions were judged “wholly inadequate” by the European Union chapter of Transparency International. On 18 April, following a request formulated by the European Ombudsman in January 2018, the European Central Bank (ECB) published its decision on the compatibility of the participation of the President of the ECB, Mario Draghi, to the meetings twice a year of the G30, an international bankers club based in Washington. The European Ombudsman expressed her disappointment and declared this was a missed opportunity to increase citizens’ trust in the action of the ECB. On 19 April, following discussions in March, the members of the European Parliament adopted a resolution calling for a better protection of journalists in the European Union and for an in-depth, independent and international investigation on the murder of the Slovak investigative journalist Jan Kuciak and his partner. On 23 April, the European Commission submitted a proposal to strengthen whistleblower protection across the EU, following different instances of general interest breaches that were revealed by citizens (Dieselgate, LuxLeaks, etc.). This proposal « ensures EU-wide protection for blowing the whistle on breaches of EU legislation» including notably public procurement, financial services, money laundering and terrorist financing, animal health and welfare, public health, or privacy, data protection and security of network and information systems. In its press release, the Commission encouraged Members States to go beyond this norm and implement general whistleblower protection frameworks based on the same principles. On 22 April, the International Monetary Fund (IMF) announced the adoption of a new corruption evaluation framework that will be more systematically used in its 189 Members States. This new framework, which targets more generally governance, was adopted by the executive board on 6 April and will allow to regularly assess the nature and seriousness of corruption as of 1 July. The IMF will also look at private actors such as enterprises involved in corruption practices or take part in money laundering. This announcement was welcomed, notably by Transparency International, which calls on the international organization to publish the main information gathered in its evaluations and to foster consultation of civil society. 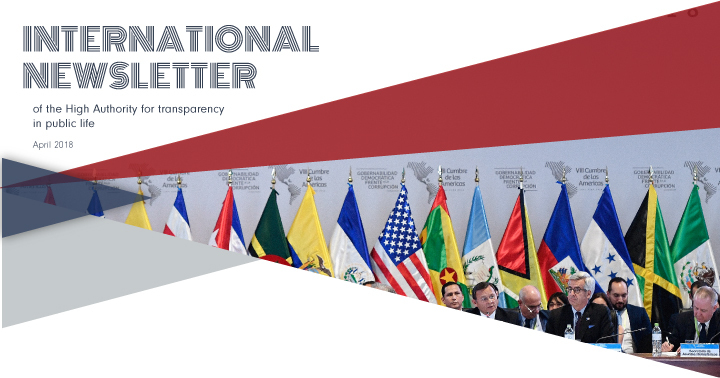 On 19 April, Transparency International called on G20 countries to speed up action to fight corruption, notably in its monitoring of the commitments taken in following the Panama Papers with regard to beneficial ownership transparency. The report pointed at 11 countries that still have a weak or average legal framework despite the adoption of High-level principles of the G20 in this field in 2014. The United Kingdom, Argentina, France and Italy gained good results with the adoption of strong or very strong legal frameworks for the first one. Over the week of 16 April, the “Daphne project”, named after the Maltese investigative journalist Daphne Caruana Galizia murdered in October 2017 who was denouncing corruption in Malta, published the results of the pursuit of the investigations she had initiated. 18 news media gathered by « Forbidden Stories » partnered to understand who ordered her murder, follow the traces of the Azerbaijan money in Europe, shed light on the trade of the Maltese nationality or the so-called « Golden visas » that for 1 million euros, open the doors of the European Union and allow to escape international sanctions and benefit a favorable tax system. On 6 April, former South-African President Jacob Zuma appeared before the Court of Durban to face his corruption and money-laundering charges in an arm contract case that has been lasting for 20 years. The trial is postponed to 8 June. Mr. Zuma would have received 4 billion euros from the Thalès group in the framework of the awarding of an armament contract in 1999. The company is also prosecuted in the same case. On 16 April, assets of the Gupta, a businessmen family at the center of the corruption case involving the former President, were seize. They are also accused of benefitting from favors of the Government under his presidency and embezzling about 20 million dollars that aimed at supporting milk producers. Violent protest took place in South Africa over the week of 16 April. Protestors notably asked the resignation of the Prime Minister of the North-western province, a supporter of ex-President Zuma. Considering the violence of the protests, President Ramaphosa had to return to South Africa swiftly. On 24 April, a teenager was killed in the riots between police forces and protestors. On 10 April, le Monde published investigation results following the Paradise papers revelations on how the company Total helped Congo to implement practices that were forbidden by the IMF to its beneficiary countries. In 2003, the oil company obtain the deletion of various disputes with Congo in exchange, for the token price of one franc, of parts in a maritime oil concession. Congo wanted to sell in advance the oil that would be exploited in the following years, which is a practice forbidden by the IMF to any of its beneficiary States. The documents highlighted how Total created a complex offshore system to hide the identity of the new owner of the oil field. On 11 April, the Ivorian National Authority of public procurement regulation indicated that, since 2014, 36 enterprises had been excluded from public procurement procedures following corruption cases. This sanction is considered as peculiarly heavy as public procurement represents about 1.5 million euros a year. But the Authority recognized it was heavily pressured to stop implementing its missions. From 22 to 25 April, the High Authority for good governance (HABG) rose awarenss among local authorities and citizens of the regions of Iffou, N’Zi, Moronou, Bélier and Yamoussoukro on prevention and fight against corruption. This campaign ended with the creation of a “anticorr platform ” in Yamoussoukro, formed with elected officials and traditional chiefs in order to be a relay for citizens. Taken into custody on 24 April, Vincent Bolloré, a French businessman, was charged on 25 April for corruption of foreign public official and collusion in breach of trust and forgery and falsification of reports. These charges are related to the way the Bolloré Group obtained in 2010 the management of the ports of Conakry, in Guinea, and Lomé, in Togo. This investigation that was launched, notably, after complaints from a former Franco-Spanish associate of Vincent Bolloré, Jacques Dupuydauby, aims to determine whether the Bolloré Group used the political counsel activities of its subsidiary group Havas to obtain the management of these ports for another subsidiary group, Bolloré Africa Logistics (ex-SDV). The Bolloré group denied, on 24 April, being involved in any kind of irregularity in Africa. On 28 April, Ene Nwankpa, representative of the civil society organization « Right to know », encouraged Nigerians to ask for more transparency and accountability from public officials. She recalled that the access to information act aims at empowering citizens’ rights to scrutinize public spending and decision making. On 8 April, after a series of arrests on 4 and 5 November 2017, the general prosecutor open proceedings against some of the persons that were arrested at the time. Among them, 56 persons who did not find an arrangement in November are still being detained and will be charged for money laundering or terrorism. On 18 April, the President of the Republic, the General Michel Aoun, declared being against the possibility to hold several mandates concurrently. He also called for a secular system of functions allocation to replace the current system in which functions are allocated based on confessional representation. He also said that the absence of responsibility of public officials notably led to the proliferation of corruption. On 24 April, the Minister of finances, Ali Hassan Khalil, warned the country about the economic and financial decline related to the systemic corruption. He declared that all institutions are now facing a structural challenge to avoid any form of public money wasting and fight corruption. These topics were core to the discussions of 25 and 26 April, during a conference of transparency and good governance, organized by the European Commission in the framework of a technical assistance and information exchange project (TAIEX). On 4 April, the National Commission against corruption held its first meeting. Created in a decree of November 2017, i twill now be tasked with implementing the national anticorruption strategy, presenting proposals and programs to strengthen transparency and promote values of moralization and integrity in public life. On 4 and 5 April, the Tunisian National instance against corruption (INLUCC) organized, with the French Embassy in Tunis, the French Institute and the French development agency, the second Franco-Tunisian days against corruption, which aim at strengthening cooperation between both countries on this matter and at offering a platform for dialogue of actors from both sides of the Mediterranean. The 2017 edition focused on the role of international cooperation in the detection and prosecution of cases of corruption. Most roundtables gathered speakers from Tunisia and France in order to present the methods they respectively use. On 27 April, the National instance against corruption announced it executed the first whistleblower protection decision in an alleged corruption case within the Tunisian national railways company. It aims at the reinstatement of the agent in the former functions, at the payment of wages and annulment of all administrative decisions against the person following a testimony in a case of corruption. The 8th Summit of the Americas took place on 13 and 14 April and gathered 33 Heads of State of te continent. Corruption was central to the discussions. The debates highlighted a link between quality of democracy and fight against corruption. Yet Christophe Ventura, from the Institute of International and Strategic relations, stressed that the final agreement, which was signed by the 34 countries that took part in the conference, offered several axes for modernization of public action but nothing about the means to be allocated to achieve such goals. On 25 April, Radio-Canada stressed the fact that Facebook breached the federal rules on lobbying. The federal Commissioner, Nancy Bélanger, answered a letter from the member of Parliament Charlie Angus who voiced concerns on the fact that Facebook, which performed lobbying activities towards Ministers, was not registered. In her answer, the Commissioner ensured that her office proceeds to the verifications but did not confirm whether or not an inquiry will be open. On 26 April, the Ontario Integrity Commissioner, J. David Wake, published his report on the former chief of the Tory Party of Ontario, Patrick Brown. He concluded that Mr. Brown broke the MPs ethics law four times. He omitted to declare a 375 000$ loan and the rental revenues of his personal residency. The Commissioner recommended that he is sanctioned, as this is a prerogative of the National Assembly. On 1 April, the New York Magazine dedicated its front page to President Trump and corruption. The bimonthly magazine denounced, in an article, corruption as the main weakness of the President stating that not only Trump does no effort to increase ethical standards but he is himself and his administration in violation of the existing rules. On 5 April, the New Yorker recalled the alert launched by Simon Edelman, former Chief creative officer for the Department of Energy. On that day, Mr. Edelman lodged a complaint to the US Special Counsel Office, the agency tasked with the protection of federal employees notably as whistle-blowers. In March 2017, he had photographed a meeting between the coal magnate and Rick Perry’s donator in his 2012 campaign, Robert Murray, during a meeting with Energy Secretary Rick Perry. On this occasion, the businessman had given him his “Action Plan for reliable and low cost electricity in America and to assist in the survival of our Country’s coal industry”. In September 2017, Rick Perry had sent a letter to the Federal Energy Regulatory Commission to protect resiliency of the electric grid with a peculiar emphasis on coal and nuclear, echoing Murray’s action plan. Edelman had then sent his photographs to journalists of the Washington Post notably, which were published on 6 December, one day before he was placed on administrative leave. His lawyers support that he alerted on a corruption and ethics violation case. On 21 April, by 370 votes out of 500, the Mexican Parliament agreed on a constitutional reform putting an end to the immunity of the President and elected officials in general, a change called for by civil society for year in order to fight against integrity breaches. This decision has a special symbolic dimension, a few weeks before the presidential, legislative and governors’ election that will take place on 1 July. On 26 April, the Constitutional Court of Peru ordered the liberation of the former President, Ollanta Humala and his spouse, who had been detained since July 2017 for corruption. The Court took a decision favourable to an habeas corpus while the prosecution office investigates the case of the former president for money laundering. Ollanta Humala would have received 3 million dollars from the Brazilian giant Odebrecht for his campaign in 2011. On 18 April, the Court of Appeal of Porto Alegre announced it had unanimously rejected Lula’s third and last possible before this tribunal. His lawyers will now have to turn to other superior courts. On 16 April, after Integrity Watch EU and Integrity Watch France, Integrity Watch Chile was launched. It is a central platform enabling citizens, journalists and civil society to control integrity in the decisions taken by public officials in Chile. This tool allows to filter rather simply and intuitively the data published with regard to meetings of members of Government and Parliament with third parties and with regard to interests and assets of public officials. On 12 April, Mr. Sun Zhengcai, the highest Chinese public official condemned while being in duty over the past five year, pleaded guilty in a corruption trial . He had been dismissed from his functions of chief of the Chinese communist party of the municipality of Chongqing during summer 2017. He was accused of accepting more than 22 million euros in bribes and gifts over his political career against awarding public contracts. On 6 April, the ex-president of the Republic of Korea Park Geun-hye was condemned to 24 year jail sentence and a 13 million euro fine in the framework of the scandal that resulted in her impeachment and arrest in March 2017. She was found guilty of corruption, abuse of power and coercion. Her confident, Ms. Choi, at the heart of the case, was sentenced to a 20 year jail time in February. On 16 April, the ex-president submitted a document to Justice in which she declared she would not appeal this decision. But the case will be heard by a second level court because the prosecutor’s office appealed the first decision on grounds that the court unfairly dismissed two out of the 18 initial charges. The prosecutors had requested a 30 year jail time and a fine exceeding 90 million euros. A few days after, on 9 April, the prosecutors announced they would charge ex-president Lee Myung-bak (2008-2013) for corruption. He would have received several million euros in bribes and would face 14 charges. He is the fourth Head of State to be arrested and judged for corruption in the country. On 19 April, the Anticorruption and civil rights commission (ACRC) a five year comprehensive anticorruption plan based upon 50 tasks to fight against corruption in the public and private sectors. On 30 April, in a press release, Transparency International voiced concerns following recent calls on the director of the Independent anticorruption authority of Mongolia to resign. The organization called on the President of Mongolia to stop undermining the anticorruption efforts across the country and threatening the national agency. On 13 April, the Supreme Court of Pakistan, after his impeachment nine months ago, banned former Prime Minister Nawaz Sharif from political life permanently. This decision followed revelations of the Panama papers and his involvement in a corruption case. On 23 April, the Prime Minister Serzh Sargsyan resigned amid important protests since 13 April in the country, that pointed at poverty, corruption and distrust of citizens towards their public officials. Some protestors deplored a systemic corruption with bribes needed in many administrative procedures. On 19 April, Dessislava Ivantcheva, district mayor in Sofia, face a heavy-handed arrest by the new anticorruption unit in Bulgaria as she is suspected of accepting bribes. It was one of its first operations since its creation by the Government at the beginning of the year. Observers questioned the violence of the operation. Indeed, she is accused of accepting the payment of 500 000 euros in bribes in a construction project. The conservative Government in Bulgaria was encouraged by the European Commission to adopt a new anticorruption law before the country took its presidency of the EU in January 2018. On 5 April, a little more than a month after the murder of the journalist Jan Kuciak, Slovaks kept protesting against corruption and for the resignation of the Police chief, Tibor Gaspar, after that, at the end of March, Prime Minister Fico resigned and was replaced by Peter Pellegrini. New protests were organized on Sunday 15 April to ask again for the police chief’s resignation. Protestors feared that no proper investigation would be opened on the assassination of the journalist. Confronted with these manifestations, on 17 April, the Prime Minister Peter Pellegrini finally announced that Tibor Gaspar would leave his functions in May 2018.